If you're in the market for one, which one should you buy? Do you want simplicity, or Android baked into a watch? Here I'll briefly go through a few of the main ones on the market at the moment. It's tough to track down all of them, since they've been around since the 80's. I will only include the watches that stand out, so the inPulse, the WINN watch and all of those 'health oriented' watches won't be here. Nonetheless this should help you decide! Disclaimer: I have not tried any of these watches in person. I have ordered a Pebble, and have a huge interest in the new industry. Therefore I'm not biased. The most famous to date and the watch that kicked off the modern Smart Watch dream. Coming straight out of the Kickstarter oven, this watch has had it's ups and downs. On the plus side, it was the most backed project on Kickstarter raising over 10 Million and seems to work brilliantly. On the down side, they've been taking their time in making it and shipping it. It's been over a year now and the backers have only gotten their watches now. Not only that, but the app compatibility hasn't been amazing. With so many people annoyed at them, can the watch lead up to expectation? Wired: E-Ink Display, Bluetooth 4.0, week long battery life, custom watch faces, Android and iOS, water proof (mainly for showers, not diving). Tired: Plastic isn't very smart looking, taking too long to produce, app selection is poor. This watch takes a normal analog watch, and then adds to it. It's built to be a normal watch before we start thinking of smart stuff. In return for having a normal looking watch, you'll of course miss out on a lot of features. This was another Kickstarter project that was fully funded. Wired: Normal looking watch, battery lasts for a year, various colours, water resistant, can sound an alarm on your phone to help you find it, bluetooth 4.0. Tired: Not very future proof, battery will need to be replaced, a little bit on the chunky side. 'Hey what if Siri was on your watch?' was the thinking here. They took what CooKoo had and added a microphone. This watch also has a tiny OLED display to see who's calling and what not. The watch comes in 3 different styles and many different colours, so there's lots to choose from, which is great to see. If Siri floats your boat then this is the watch for you. For those of us who would find talking to your watch unnerving, there are plenty of watches that don't listen in. Normal accelerometer and things included of course. Wired: Great looking quartz watch, 7 days battery on standby, Bluetooth 4.0, Micro USB charging, noise canceling microphone. Tired: Only 2 hours of call time, voice recognition is not reliable enough to do a lot at present day. This watch strikes me as a Pebble replacement. It's blockier, but it also has a stainless steel frame around it. They also make a "Strata" version that's a little bit more sporty/plastic-y. To me the screen doesn't seem to be up to a huge amount, but I have yet to see it in person. It's 96 x 96 pixels, versus Pebble's 144 x 168. Accelerometer, ambient light sensor, Droid and iOS etc. People who own it however say that the Pebble is streets ahead and is far more stable. Most of the issues are to do with the screen. Wired: Completely different styles available, steel frame on some, 5-7 days battery life, Bluetooth 4.0. Tired: Smaller resolution screen than competitors, expensive for what you get. Oh god the i'M Watch. The Marmite of smart watches. On paper it looks incredible, and on their site it looks even better. YouTube videos tell otherwise however, and seeing this thing in action makes you realise that it's not as smooth as you'd think. With that being said though, it does offer the most. Features wise, this watch beats the competition like it's on a GTA rampage. Sporting a 240 x 240 TFT colour display (with 220ppi), 4GB of flash storage, 128mb of RAM and a custom version of Android, this watch is packed full of everything. This thing wants to be your second phone - it even has a built in 3.5mm headphone jack! It all comes at a cost though: 5 hours battery life (with usage) and a $330 price tag. Wired: Full on display, runs Android, can act on it's own accord without a phone, 3.5mm jack, lots of different styles to choose from. Tired: Hard to control a very small touch screen, can freeze up a bit at times, battery life is poor, price is not for the poor, screen is hard to see outdoors. When the big guns enter a market, it's getting serious. Powered by Android, I'd say it's competing with i'M Watch more so than the e-ink bunch. Unlike the i'M Watch though, Sony's efforts are meant to only ever be connected to select android phones. ie: Sony's own phones and a few other Android handsets. There is no support for iOS, Blackberry or Windows Phone. The 128 x 128, 1.3 inch screen, is a touch screen and seems a bit clunky. The swipes are not always registered etc. The watch does look the part, but it's a fancy paperweight if it's not connected to a Droid. Wired: Stylish watch, trusted manufacturer, runs Android. Tired: Touch screen is hard to manage, battery life varies per user but 3 days is expected if it's off at night, no iOS support. Finally a Smart Watch made by a watch manufacturer! The GB6900AA (what a name..) is pretty much just a normal G-Shock watch with a Bluetooth 4.0 add on. This is the complete opposite to the Sony SmartWatch. It can locate your phone (via sounding an alarm on it), receive the normal call/text notifications and alerts you when it's too far away from the phone. All of that lovely, standard, stuff.The watch is only compatible with iOS though to my knowledge, which is sad because it looks like a great watch that lots of people could want. On the plus side, it has a 2 year battery life! Wired: Trusted manufacturer, Bluetooth 4.0, doesn't look out of the ordinary, 2 year battery life. All of those words individually sound bloody cool, but together they make no sense. The same can be said for this watch. 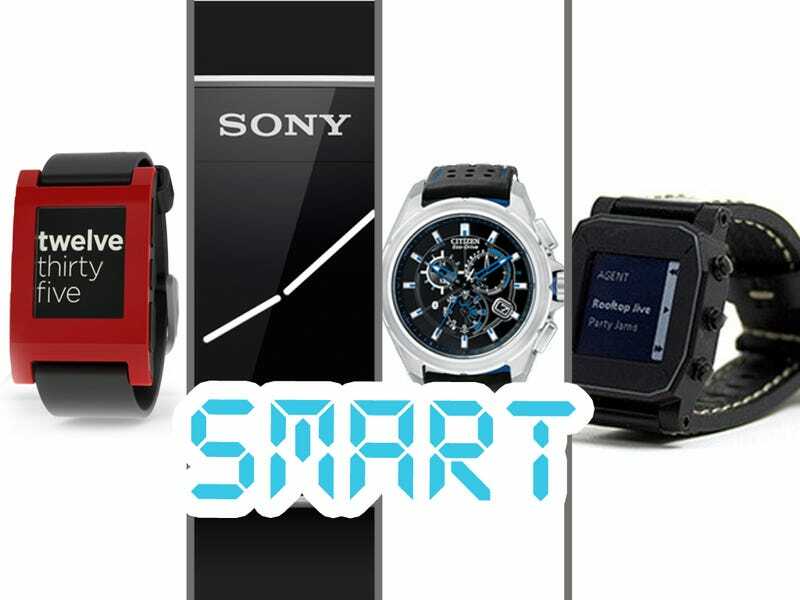 The efforts of another watch maker getting in on the smart craze, and they're aiming high. By high, I mean people with money. And by aiming, I mean pretty much selling the same stuff as they normally do. That being said though, it does look amazing and manages to pack some interesting features. It's able to do all of the standard Smart Watch things, like notify you and find your lost phone. It packs bluetooth 4.0 and never needs any battery replacement or charge because it uses the light around it to power itself. Indoor or outdoor is fine. Solar powered Smart Watch - Great! Unfortunately thought there is no Android support. Not even that, it only supports the iPhone 4S and 5 which only leaves a select market. Add that onto the price $500 price tag, and this watch is a tough sale. Still though, if luxury watches are your thing, then this suits. Wired: Very good looking, charges via sunlight, comes in 2 colours. Tired: Only for rich folks, no Android support, not even older iOS support. Sounding like it belongs in a sci-fi flick, it also looks the part too. The Indigogo attempt has yet to reach it's goal, and that's likely due to their lack of prototype coverage and issues that they've been having with PayPal. All that we have to see are these glorious mock ups! Although it is made out of machined titanium so it will withstand a beating, there will be a cuboid version and a round version, it will run Android 4.0 Ice Cream Sandwich, can act as a standalone phone with a built in speaker and 3.5mm jack. All for.... $750! I contacted the guys behind it, and one of them came back saying that they really believed that this fully loaded approach was the right way to go. Eventually they showed off the OS, which you can see below. I'm afraid that it's hard to see this taking off, but I guess we'll have to wait and see. Wired: Fully functioning phone, titanium, 3.5mm jack, water resistant. Tired: Very steep price, trying to do too much, unable to see the watch properly, not yet invested in fully. Dubbing itself as the sexiest Smart Watch available, this Kickstarter project seems to be on its way onto peoples wrists soon enough. It looks good, it charges via a Qi wireless charger and has 7 days of battery life. Having House of Horology behind the project is neat too. It's really just competing against the Pebble, and is for the people that don't like the cheap-ish look of the Pebble. It's 128 x 128 Sharp Memory Display (which apparently has a faster refresh rate than an e-ink) will be able to display apps and things from their open ecosystem (you can side load in whatever you see fit). Really the Agent stresses to improve upon the Pebble and it seems to have done just that! Although, set to be at $250, this doesn't undercut the Pebble at all. Wired: Looks great, 7 days of battery life, Memory Display, open source, runs on iOS, Android and Windows Phone 8, assembled in the USA, BT 4.0, water resistant. Tired: High price tag, wireless chargers are expensive, not a lot of apps to show off yet. Well that really wraps it up. If people have any more suggestions to consider please say so below. If I got anything wrong also, tell me and I'll edit this post. I'll leave you with what could possibly be the best looking 'Smart Watch that doesn't really do anything' watches: The iPod Nano.